Tyre Racking is used to store tyre for auto parts shop or auto parts distributor. Usually Tyre Racking is Similar with longspan shelving, the different is tyre racking use round bar to be beams instead of step beam. Steel shelf can also be removed to save cost. The other type of tyre racking is stack racking. In this case we can use stack racking to put tyres. Thus forklift can load/unload the stack racking to trucks. It’s widely used in large tyre manufacturer or logistic center. The tyre racking can be stackable for 5-6 levels which maximum space in height direction, one level can take 800-1000kg capacity. It’s very helpful for large quantity of tyre to turn over frequently. This customer was a African auto distributors which have a big warehouse for truck tyre. The tyer is very big and heavy, thus we recommend customer choose stack type tyre racking. The system can meet the customer’s requirement properly. Also it’s dis mountable / foldable style to save freight cost, which also reduce the logistic cost for customer, when customer don’t need it, they can just foldable the system and don’t need large space. 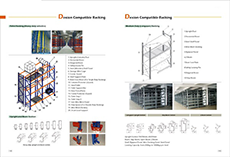 Customer is happy with the solution, they already consider T Racking as strategic partner for storage racking system. They will build several more logistic center in 2014 and purchase tyre racking from us.